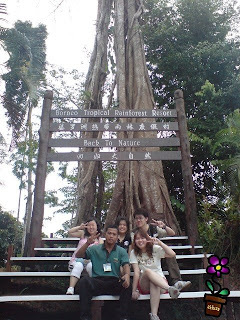 Two week ago, i go to Borneo Rain Forest, miri, with ma friends, da jie and her KL friends. Here is Borneo Rain Forest?? It is just 30-40 km from Miri town, so it consider as near for us. when u entry da rain forest, Rain Forest employee will lead us to parking space and bring us to the main buliding. this is da main building...when u enter, they will give u a glass of orange juice...cooL services! da big track going to bring us go around loh...weee..let go!!!! this is da intructor which are bery bery funny...cos i keep on asking him.."mana harimaO"
and this is white white duck...make sure u remember that duck is white..not the roasted one..
this tree bery special...ahaha..the purpose for this tree is to let the lighting to hit ...so no one get hit when walk around..do u believe?? but safety go first...well, we do is look around...feed da fish...and if u wan to, u can try to catch da fish..but make sure not da crocodiles...i will jump da boat..
their lobby with many many chair...round rottan chairs...which can spin around if u like to..
ok...i am read to drift da boat!! bring it on!!! i am quite surprise is that all da employees are bery bery friendly and keep on smiling..feel like u having a relax and happy holiday trip somewhere in da forest!cool! this holiday trips is cool and i think i will intro to ma friends..if u never been there before, you should try to go there once....relax your mind and having fun! wat u waiting for?! grab your bag and book your airtickets to Miri. Tiger Airways will be a good choice to let u travel around! Tiger Airways is currently celebrating its 4th anniversary by having a special birthday fares starting from S$0.04 to various destinations. Tiger Airways is Asia Pacific's true low fare airline. It offers passengers not only one of the lowest possible airfares in the market, but safe, reliable and convenient point-to-point air travel as well. Tiger Airways now flies to more than 27 destinations across 9 countries in Asia-Pacific on a fleet of brand new Airbus A320 aircraft. how come i dont know about the borneo rainforest one?